We are already a quarter of the way through the 2018 NFL Season (crazy to think it’s already October?!) and many have already started to ask if there is reason for concern if you are a Philadelphia Eagles fan. My personal answer to that question is, well… maybe, but many others are on the fence. In this I will describe why there may or may not be a reason for concern. However, at the end of this, you will have to decide for yourself – concerned, or not concerned…that is…still the question… shall we? My main reason to “maybe” be concerned is that the injury bug has struck the Eagles so far this season. Along with winning the Super Bowl last year, comes the shortened off-season compared to other teams. First, you still want and need to get back the guys who suffered season-ending injuries last year (3 started week 1). Along with that group, the Eagles had a lot of players who received off-season surgery who slowly have made their way back. Big names include Carson Wentz, Darren Sproles (injured again…), Jason Peters, Brandon Graham and Alshon Jeffery (week 4 was first game back). Aside from those kinds of injuries, you have injuries that happen every week – right now the two biggest names that are hurting are Corey Clement with a hamstring injury and Jay Ajayi playing with a slight fracture in his back. 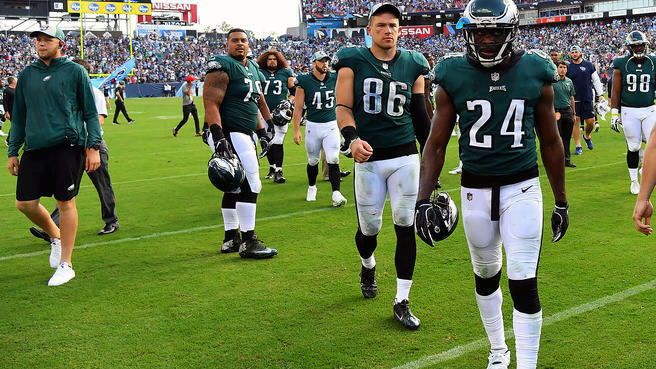 As if the injuries adding up isn’t bad enough, the team also lost key pieces from their Super Bowl team, with the three biggest departure being RB LaGarrette Blount (could sure use him now), TE Trey Burton (though we replaced him with Dallas Goeddert), and CB Patrick Robinson. Of course, if that isn’t enough for you, technically, we are no longer the ‘underdog’… we’ve become the top dog and each and every single week you are going to get every teams best… so the Eagles just have to be prepared for that. Need another reason to be concerned? Coming right up – The offense is struggling to score points so far through the first four games of the season. Last year the Eagles averaged 25.8 PPG through the first four while this year their average has slipped to 20.3 PPG. Also, prior to this week people were concerned with the lack of shots taken down field or those so-called big gainers. I believe last week’s game started to silently put that notion to bed when Wentz connected on a 56-yard touchdown pass to Jordan Matthews (yes… he’s back). 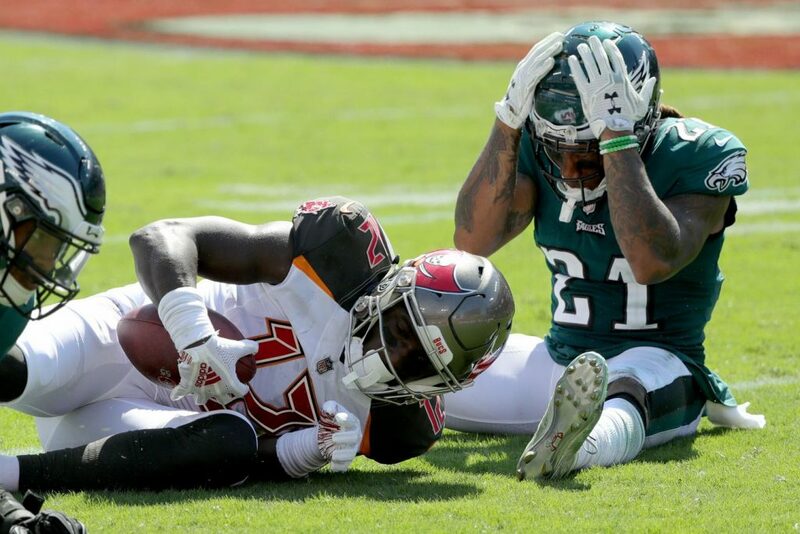 Now that you have a “solid” (not good or bad) 1-2-3 WR duo on the field in Jeffery, Agholor, and Matthews, I believe the deep threat will slowly make its way back into play. Okay, okay… Let’s be real: The MAIN reason why people are concerned is the lack of the play of the defensive backfield (Mills, Darby, Jones, Jenkins, and now Graham cause of the injury of McLeod). Totals: 2,111 Yds 17 TDs 3 INTs allowed. After receiving the above information from my good friend Vinnie Pellegrino (via a tweet by @TwitDarius), I would have to agree that the secondary needs some fine tuning; the kind of tuning that you need to give an old acoustic guitar with decades of dust whose strings are super rusty and should really just be replaced. Okay, maybe that was harsh. People can point fingers at the head coach and defensive coach all they want to, but I asked myself today why the defensive backs coach (Cory Undlin) has yet to be mentioned – after all the guy is in charge of the secondary… isn’t he? My only other question about this year compared to last year is why we are decent at home but can’t play on the road. The first two roads games have practically been like home games (Tampa Bay and Nashville) thanks to all the crazy Eagles fans (myself – Tampa Bay and Mike Wright – Nashville) traveling to these away games. If you ask Joe, he seems to think the only reason the team lost those two games was because Mike and I were at them… maybe he’s onto something? In closing I want you to ask yourself — are you concerned with the start to the season? Only time will tell how it plays out!!! Let us know your thoughts in the comment section!